1. Which scheduling policy is most suitable for a time-shared operating systems? In order to schedule processes fairly, a round-robin scheduler generally employs time-sharing, giving each job a time slot or quantum (its allowance of CPU time), and interrupting the job if it is not completed by then. It is designed especially for time-sharing systems. 2. Consider a set of n tasks with known runtimes r1, r2, … rn to be run on a uniprocessor machine. Which of the following processor scheduling algorithms will result in the maximum throughput? Throughput means total number of tasks executed per unit time. Shortest Job First has maximum throughput because in this scheduling technique shortest jobs are executed first hence maximum number of tasks are completed. Note: Highest-Response-Ratio-Next policy favors shorter jobs, but it also limits the waiting time of longer jobs. 3. Which of the following scheduling algorithms is non-preemptive? 4. Consider three CPU-intensive processes, which require 10, 20 and 30 time units and arrive at times 0, 2 and 6, respectively. How many context switches are needed if the operating system implements a shortest remaining time first scheduling algorithm? Do not count the context switches at time zero and at the end. Time 0: Process A arrives and its the only available process so it runs. Time 2: Process B arrives, but A has the shortest remaining time (8), so it continues. Time 6: Process C arrives, but A has the shortest remaining time (2), so it continues. Time 10: Process A is completed and context switching takes place. B is scheduled as it is the shortest remaining time process. Time 30: Process B is completed and context switching takes place. Now C is scheduled. 5. Group 1 contains some CPU scheduling algorithms and Group 2 contains some applications. Match entries in Group 1 to entries in Group 2. The jobs are assumed to have arrived at time 0 and in the order p, q, r, s, t. Calculate the departure time (completion time) for job p if scheduling is round robin with time slice 1. 7. The sequence …………… is an optimal non-preemptive scheduling sequence for the following jobs which leaves the CPU idle for ………………… unit(s) of time. Shortest Job First is an optimal solution for non-preemptive scheduling. Hence the sequence should be 3,2,1. For that sequence to occur the CPU should wait for 1 units of time. 9. A uni-processor computer system only has two processes, both of which alternate 10 ms CPU bursts with 90 ms I/O bursts. Both the processes were created at nearly the same time. The I/O of both processes can proceed in parallel. Which of the following scheduling strategies will result in the least CPU utilization (over a long period of time) for this system? We are given that the time slice is 5ms. Consider process P and Q. Say P utilizes 5ms of CPU and then Q utilizes 5ms of CPU. Hence after 15ms P starts with I/O And after 20ms Q also starts with I/O. Since I/O can be done in parallel, P finishes I\O at 105th ms (15 + 90) and Q finishes its I\O at 110th ms (20 + 90). Therefore we can see that CPU remains idle from 20th to 105th ms.
Say P utilizes 10ms of CPU and then starts its I/O. At 11th ms Q starts processing. Q utilizes 10ms of CPU. Since only two processes are involved and I\O time is much more than CPU time, "Static priority scheduling with different priorities" for the two processes reduces to FCFS or Shortest remaining time first. Therefore, Round robin will result in least CPU utilization. 10. Consider the following set of processes, with the arrival times and the CPU burst times given in milliseconds. What is the average turnaround time for these processes with the preemptive shortest remaining processing time first (SROT) algorithm? Calculate the Turn Around Time (TAT) for each process as shown in the table below. 12. Consider three processes, all arriving at time zero, with total execution time of 10, 20 and 30 units, respectively. Each process spends the first 20% of execution time doing I/O, the next 70% of time doing computation, and the last 10% of time doing I/O again. The operating system uses a shortest remaining compute time first scheduling algorithm and schedules a new process either when the running process gets blocked on I/O or when the running process finishes its compute burst. Assume that all I/O operations can be overlapped as much as possible. For what percentage of time does the CPU remain idle? 14. Consider the following table of arrival time and burst time for three processes P0, P1 and P2. For FCFS, the order of execution will be according to their arrival time. The one which arrives first will be scheduled first. So the sequence of completion according to the FCFS policy will be P1, P2, P3. Since we have such option only in option-c its the right answer. Then what about RRS policy. Is the completion order given in option-c correct? Yes it is! 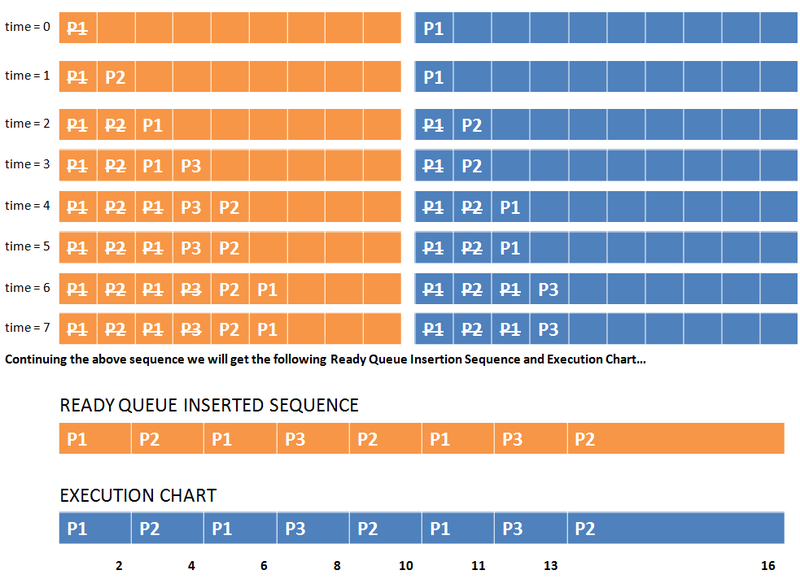 The execution chart and ready queue sequence at each time unit is given below. The orange box shows the Ready Queue Sequence and Blue shows the Execution Sequence. If the arrival time differs for the processes, always try to draw the ready queue also. Ready Queue will give you the the exact process to be scheduled next. can anyone please explain execution chart of ques 12?? In last question for RRS, process completion must be P3,P1,P2 . If not please explain. And please explain question 11 more clearly. btw thnx for giving all those ques ans with explanation..
for question 15, options do not seem to be correct. The RR scheduling would execute three processes like P1,P2,P3,P1,P2,P3,P1,P2,P2....Can any one please confirm the same or correct m eif i am wrong..
when i solved it in my copy .. Yes..I'm also getting P3,P1,P2 ..at time 4,P3 already arrived so we can schedule it right..? what is service time in scheduling algorithm. Thank You brother! Really helped a lot! 15 Questions' answer is wrong. Answer for question no 15 is correct. Because at time 2 when P1 is pre-emptied it goes to ready queue directly. At this time P3 has not arrived. So P1 gets its second chance before P3 gets its first chance. Note when P3 arrived P1 was already in queue waiting for its next chance. So the order of execution goes like P1, P2, P1, P3, ... This is well explained by the author using ready queue. what about a process we asumes that processes arrive at random and burst-time (time required to execute on CPU) is also assigned at random. The aim is to find average waiting time and average turnaround time?